The Art Of Asking "What's Next?" What goes through your head as you walk through the threshold of a brand-new opportunity…fear, excitement, anxiety? In my case it was fear mixed with thoughts on how I would get through the locked door (don’t worry, I eventually got in.) 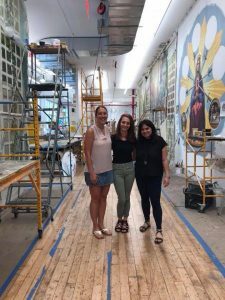 When I first started my internship at EverGreene Architectural Arts, I was quite intimidated by the level of skill my co-workers had, and it animated me to want to learn more about them and the business overall. Over the 13 weeks that I spent at EverGreene, I was able to glean a great deal of perspective and respect for the art of preserving decorative arts of historic interiors and those that dedicate their lives to such art. With the guidance of their founder Jeff Greene, EverGreene has become the nation’s largest specialty construction company for the restoration of decorative interiors and I feel quite privileged to say that I was part of that progress, if even for a short while. From an outsider’s perspective, it was incredible to dive in and learn first hand how projects were completed and what it takes to get each one across the finish line. I was also able to experience the strides the firm is taking to incorporate technology into the various studios and into offices to aid in the expansion of services provided to clients and maximize productivity and efficiency without sacrificing any traditional techniques that are required within the restoration process. EverGreene recently joined forces with Conservation Solutions Inc. this past May, the week before I started my internship, which proves they are continuously providing innovative thinking and evolving processes to lead the industry in restoration and conservation into the future. My internship with EverGreene this summer has motivated me to want to divulge into the endless possibilities regarding the integration of technology with the traditional techniques involved in the preservation of historic buildings. Majoring in Interior Architecture and Design with a minor in Public History, I have a background in a multitude of computer programs that digitally construct a building from the inside out and has interested me in the prospect of having technology play a bigger role in the future of historic preservation. This has given me a unique opportunity to be able to not just ask how technology can help but be a part of the generation of people who are proving the connection is possible.EverGreene’s Marketing Team in the Mural Studio at Industry CityEverGreene has taught me many things, one of the most important ones being that you should take on each project like you would an obstacle in life. Don’t be afraid to go out of your comfort zone and get a bit creative to solve whatever challenge gets in your way and to also never forget to paint a beautiful picture along the way. You will face a multitude of challenges all throughout your life and one quote that has become my mantra is that “it’s not the thing itself, but your attitude towards the thing,” which rings true for much of what has come across my life journey in more recent years. It’s not whether you got knocked down, its whether you chose to get back up and how you dared to put yourself out there once more. Always asking yourself “So, what’s next?” EverGreene takes on projects across the country and faces trials that sometime seem impossible to overcome but nevertheless they always persevere and leave every site with a feeling of pride and accomplishment. Whether or not a job didn’t work out or something went wrong in school that you just didn’t expect, don’t let it scare you, instead think of a way to conquer your fears and the challenges ahead and to always be in the pursuit of asking yourself “what’s next?”Authored by Lauren Ostryzek, 2018 Summer Marketing Intern. She is a senior at Mercyhurst University, and plans to graduate in May of 2019 with a degree in Interior Architecture and Design with a Minor in Public History.